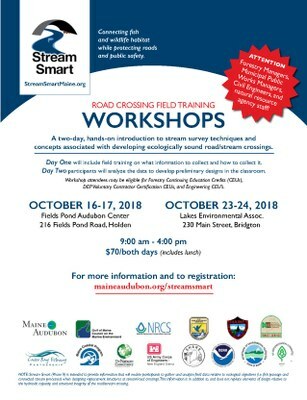 Maine Audubon will be holding Stream Smart Phase II workshops on October 16-17 at Maine Audubon Fields Pond Sanctuary, Holden Maine and on October 23-24 at the Lakes Environmental Association, Bridgton, Maine. These two-day, hands-on workshops will introduce stream survey techniques and concepts associated with ecologically sound road/stream crossings. Stream Smart (Phase II) is intended to provide information that will enable participants to gather and analyze field data relative to ecological objectives (i.e. fish passage and connected stream processes) when designing replacement structures at stream crossings. Workshop participants are expected to have some stream survey experience and work directly on road projects in such positions as forestry manager, municipal public works manager, civil engineer, surveyor, or natural resource agency staff. The October 16-17 workshop will have an optional 1-hour refresher on field survey techniques at 8am on Day 1. To register for the Holden workshop click here and to register for the Bridgton workshop click here. Participants interested in the additional “refresher” on total station and auto level techniques should contact Annica McGuirk at amcguirk@maineaudubon.org or (207) 781-2330 x219. Participants in this workshop can also receive recertification credit for the Maine Department of Environmental Protection, Voluntary Contractor Certification Program and may be eligible for Forester or Engineering Continuing Education Units (CEUs). Attendance at both days of the workshop is required.